Nice site on gnuplot, always very helpful to see any program in action. When plotting from datasets (large entries; >2000) and using the “with filledcurves”-option to overlap them- the overlapped area is full of artefacts from the lines in the background. It seems like the the stripes forming the filled area have very small gaps but since the amount of data is very dense, it creates some sort of transparency for the background. Any idea? Would be really awesome. Btw: very good site on gnuplot!! I can’t reproduce this. In 3D plots I know this problem, but not in 2D plots. Can you give me more details or sent me your data? I would like to know if there is a way to automatically change color while plotting multiple columns in a data file. generates bunch of curves, one for each row of data. This will create 9 curves with different colors, using the first column in your data file as x-axis and the nths column as y-axis. I noticed that, in contrast to gnuplot 4.4 (Windows 32 bit), gnuplot 4.6 (3/2012) pads automatically the x and y axis ranges by ~10%. Is there a set parameter to eliminate the padding for the xrange so that the rightmost point is the xrange? but didn’t get any difference between Gnuplot 4.4 and 4.6. Can you post an example were a difference occurs? 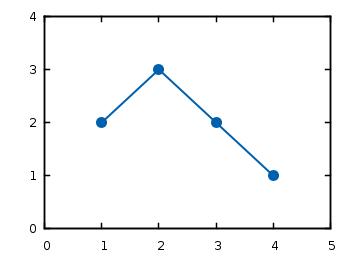 gnuplot expects and prefers data with just numbers, no text. You can tell it to ignore rows by inserting a preceding #, like BASH. The best approach would be to have the program logging your data to skip logging the text. Use colrm if you know your data is always logged exactly the same. otherwise it’s a trivial job for sed. I want to know when and how to use set table command? The set table command is useful to create data points with a plot command and do the actual plotting of the data with another command. For example have a look at the entry where I created equipotential lines with the set table command. You may also have a look in the manpage. Hello i have some questions. i use this command “gnuplot -persist -e “plot ‘data.dat'” loop.plt” in the shell. that will use the 1:2 and 1:3 and has two deferent lines. how i can do that? gnuplot -persist -e "plot 'data.dat' u 1:2 w l, '' u 1:3 w l"
gnuplot -persist -e "plot 'data.dat' u 1:2 w l, '' u 1:(\$2+1000) w l"
I believe you are missing a ” ls 1″ after “plot ‘plotting-data1.dat’ with linespoints” in your second code box. If you run the commands without the ls you’ll get the default red line with crosses. Yes, thank you very much, I have corrected it. Hi! How did u manage to get errorbars with filled circles in the middle? I think i can only get a line crossing the error bar to show where the point is. I didn’t find any info about styling error bars also. Thanks for your help!! All this is done by setting and using a line style. where pt 7 is short for pointtype 7, which is a circle. Have also a look at the overview of available line and point types. Mighty gnuplotter, how can I specify border _and_ fill colours for points? Combining a solid point type (ex. pt 7 in ps term) with a “transparent” point (ex. pt 65) will work for just a few points, but with large number of points, the border points will merge into a dark mess since they are plotted after the solid points. Ideally, one would want a point type that allowed setting both fill colour and border colour, with at least the fill colour variable from input data. I guess one could hack the ps source, but how? Hi dotter, I know this problem and I find it very annoying myself. 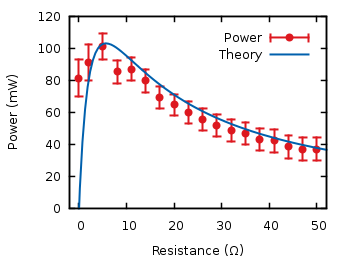 I haven’t found a solution so far and modify the plot afterwards in Inkscape. But you are right there should be the possibility to modify the postscript code. I will try to have a look at a solution in the next weeks. "-" w p pt 65 lc rgb "black" t "Example"
Postscript gurus can probably redefine either the CircE or the CircleF functions, but I’m not there yet. The “circled dot” should really be a builtin pointtype, if you ask me. thank you for the contents of the web site. 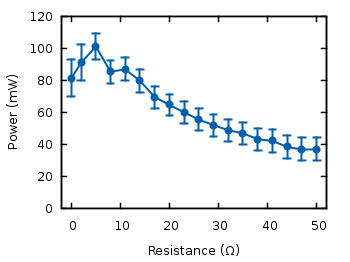 I’m wondering if you know a method to plot the curve continuously instead of a non-continuous line, although having the data separated in blocks. There is no internal solution I’m aware of. What you can do is to use another command to remove the blank lines during plotting. For example, to plot the data from Fig. 2 continuously, just execute the following code and you will end up with Fig. 6.
set datafile commentschars " -!%"
set datafile commentschars "Date -"
My question: if the last data line is corrupted, the error “Illegal month” occurs and GNUplot stops. I tried every and index without success. I guess, a procedure, which skips the last data line would fix the problem. I would like to plot each point in a file with different color or point type or both. Rather than arranging them in a single row as a long column, and then plotting each column, is there a simple way to use different color/point type for each data point in a file? Hi. Thanks for your tutorial, it’s cool and useful. But, please, fix FATAL error in first example. warning: Skipping unreadable file "plotting-data1.dat"
thanks for pointing that error out, I corrected it. Don’t worry about the formatting I add it normally to the comments after they are submitted. If you want to do it yourself, you can use <code>your code<⁄code> for inline code or <pre>your code<⁄pre> for complete lines as above in your comment. If you use <pre class="prettyprint"> it will use the color highlighting. I want to plot 1st column (1.3, 1.301, 1.302,….) 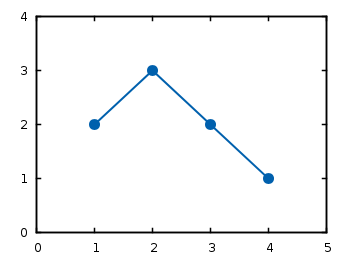 on x axis and a23 on Y axis. Other thing is that my dataset is too large. Please help me out. 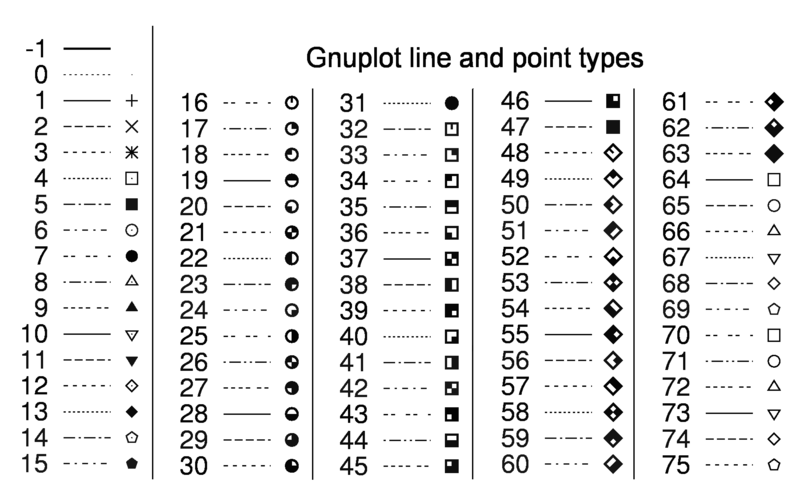 If you have very large data files you should have a look at gnuplots handling of binary files, see also the blog entry on binary data matrices. command from a file? I would like to loop through different columns of the file and set objects based on the different values contained in the different lines in each column. Would really appreciate any Help! You could have a look at Object placement using a data file or the Plotting cubes example. In both cases objects are placed/colored based on values read from a file. where can I load the file? just wondering ..can we plot the graph within the same data file ….? so that the data and graph can be in the same file. I need please the code,Thank you in advance. The gnuplottting.org is a wonderful tutorial of real application of gnuplot with many practical examples! I learned much from this site and I can now use gnuplot much more efficient. I do not see any answer to Raj from October 28, 2014 at 5:22 pm. 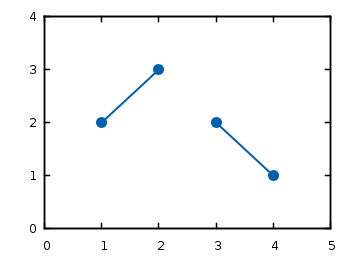 However it would be very nice if it were possible to plot different data points in the same column with different point types, so as to link them with lines but have a discrimination (in my case one point over two should be in a specific style, the rest should have no type as in “with line”). When I first saw that set style line 1 lc rgb '#0060ad' lt 1 lw 2 pt 7 ps 1.5 # --- blue line I thought “better find something simpler”, instead it’s easy to understand when all the lc, lt… are replaced with the explicit keywords. Btw, how can I markup code (both in line and in blocks) in the comments? thanks for your suggestions I updated all the code in the introduction setting to long setting names.